This cast iron fountain was purchased from the Andrew Handyside Foundry in London, near the same time, and likely designed to emulate the Choragic Monument of Lysicrates, located in Athens, Greece. It is one of four in the world known to still be in good repair and service. Drinking from the mineral springs was a social experience for visitors. 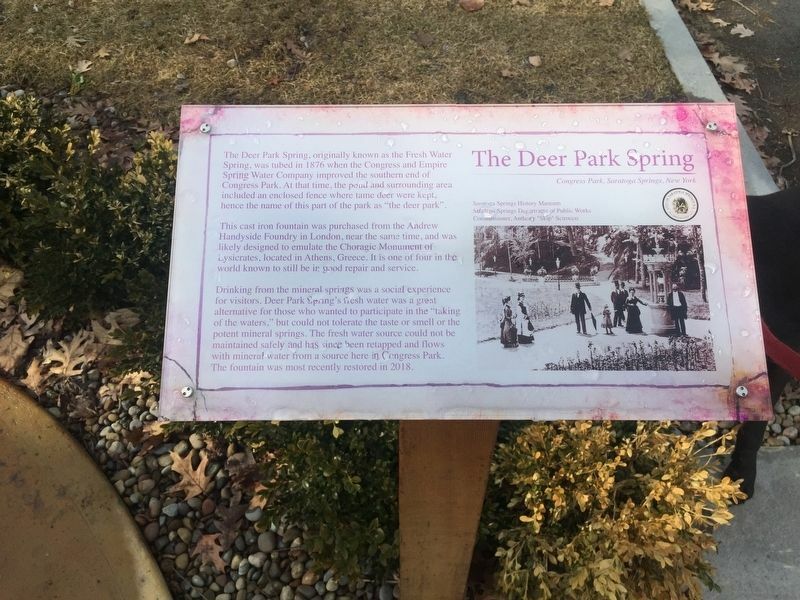 Deer Park Spring’s fresh water was a great alternative for those who wanted to participate in the "taking of the waters” but could not tolerate the taste or smell of potent mineral springs. The fresh water source could not be maintained safely and has since been retapped. 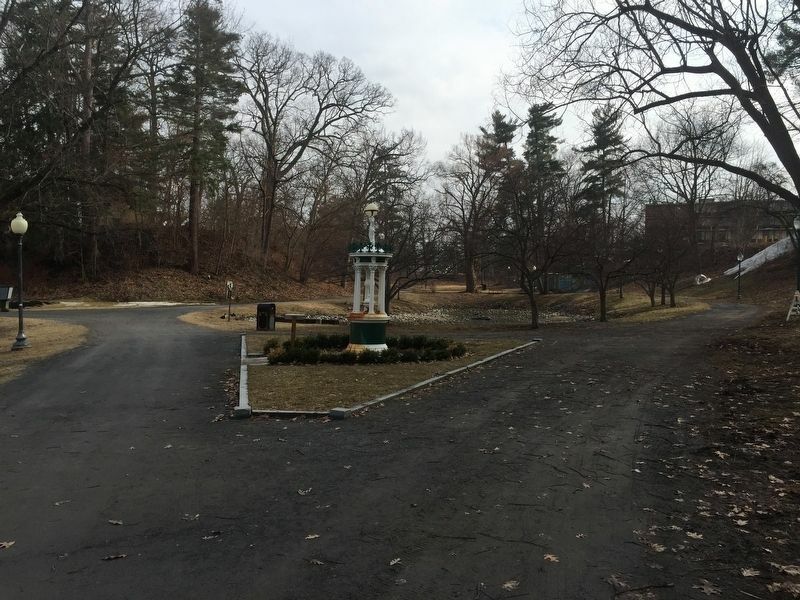 It now flows with a mineral source within Congress Park. 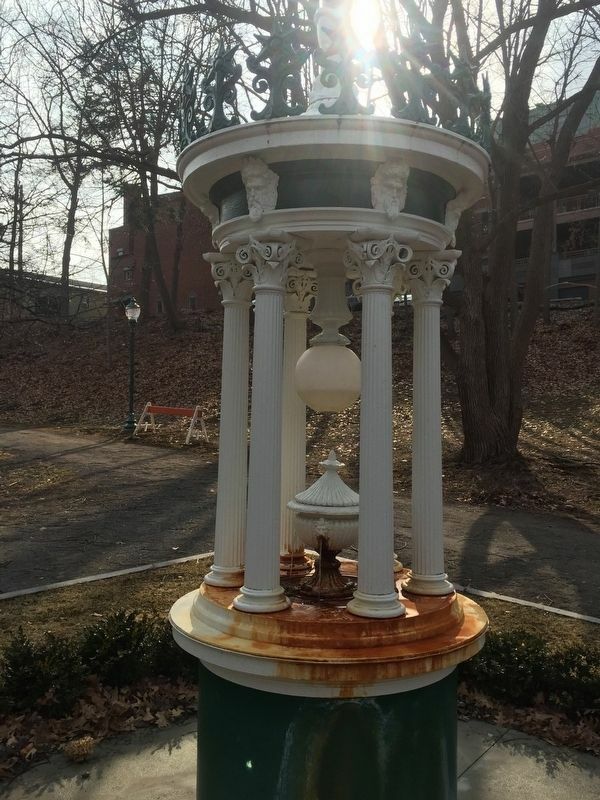 The fountain was most recently restored in 2018. 4.638′ N, 73° 47.11′ W. Marker is in Saratoga Springs, New York, in Saratoga County. Marker can be reached from Broadway. Touch for map. In Congress Park. Marker is in this post office area: Saratoga Springs NY 12866, United States of America. Touch for directions. Other nearby markers. At least 8 other markers are within walking distance of this marker. World War Memorial Pavillion (within shouting distance of this marker); Congress Park (about 300 feet away, measured in a direct line); Columbian Spring (about 300 feet away); Congress Spring (about 400 feet away); These Gates (about 400 feet away); Solomon Northup (about 500 feet away); The 77th Regiment, New York Volunteers (about 500 feet away); M.C. Illions Carousel (about 800 feet away). Touch for a list and map of all markers in Saratoga Springs. More. Search the internet for The Deer Park Spring. Credits. This page was last revised on April 1, 2019. This page originally submitted on March 30, 2019, by Steve Stoessel of Niskayuna, New York. This page has been viewed 31 times since then. Photos: 1, 2, 3. submitted on March 30, 2019, by Steve Stoessel of Niskayuna, New York. • Bill Pfingsten was the editor who published this page.